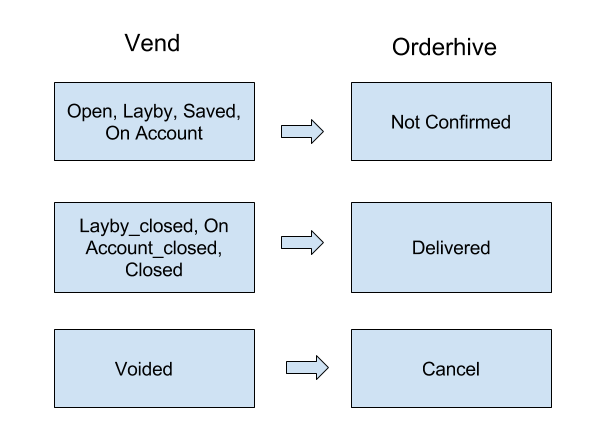 This article explains about the order and customer details Orderhive imports from Vend after integration. Once integrated, Orderhive automatically syncs sales orders and customers from Vend. Note: Orderhive doesn’t sync order returns from Vend at the moment. Orderhive doesn't import Walkin customers' details. All other types of customers are imported. This image shows the statuses synced from Vend are updated as what status in Orderhive. Note: Any changes made to order statuses in Orderhive will not get updated to Vend automatically.